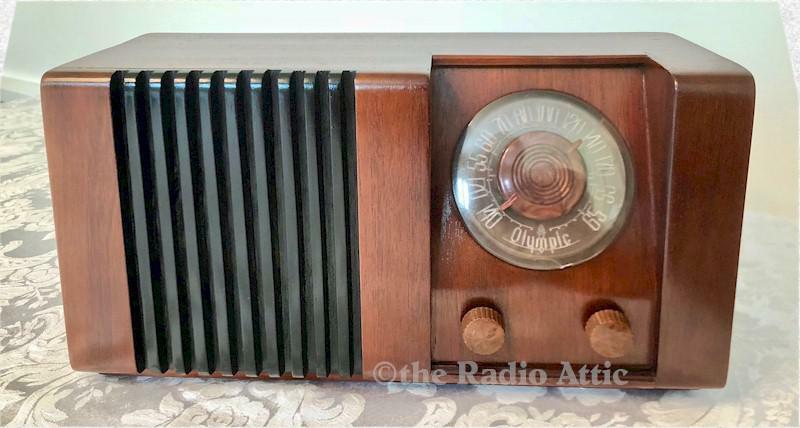 An unusual post-War set with a slanted dial and vertical grille bars accented in black, which I would say has a late Art Deco influence by Olympic Radio and Television Company. The cabinet has been nicely refinished using the very finest toning and finishing lacquers, producing a lovely luster. The clear round plastic dial cover has been polished, but does have a small crack at the very bottom, which does not distract from viewing the dial. The electronics have been completely restored (no shortcut repairs, internally fused for your safety and has a new polarized power cord), and it plays very nicely on the AM broadcast band with its internal loop antenna. I have added an MP3 input so you may listen to your own supplied music should you wish. 13-3/4"W x 7-1/4"H x 5-1/4"D.